The funky and functional OSP Designs Student Task Chair features a pneumatic seat height adjustment, which allows it to be paired with desks of all heights. A blue cushioned fabric seat and chair back keeps the design youthful and ideal for students of all ages. The heavy-duty base with dual wheel carpet casters makes it easy to manoeuvre on any number of floors and able to support the wear and tear of everyday use. Limited Warranty. Office Star Products warrants to the original purchaser that this product will be free from defects in materials and workmanship for 90 days from the date of purchase. For complete warranty details You can contact us at 1-866-382-9998 . With the look of an accent chair and the function of an office chair you'll be a buzz of productivity with this chic desk chair in your home office. 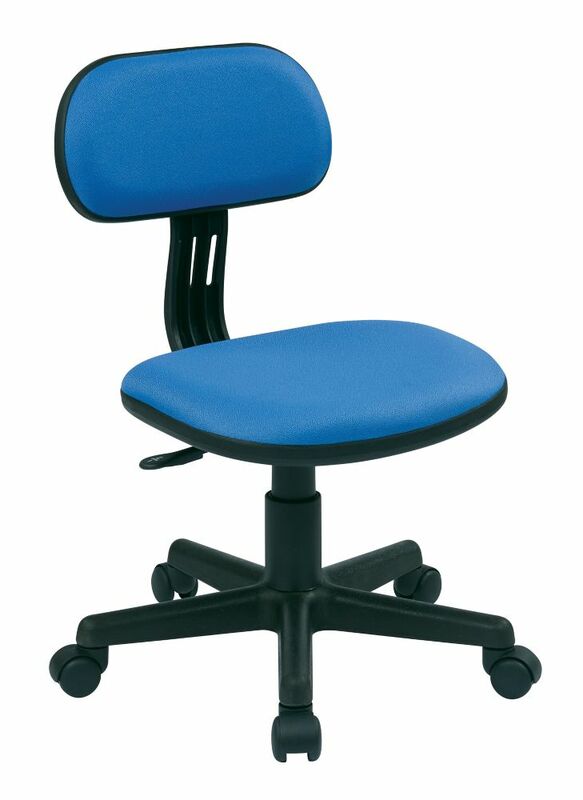 A classic button tufted, scroll back and piping trim seat with an inner foam core supports your body while you work. Easy care polyester fabric and a solid wood base offer long lasting durability and support. Create the home office of your dreams with the OSP Accents Hannah tufted office chair. Style your home desk with the convenient LOF-316-O office chair from CorLiving featuring a black fabric seat, contoured dark brown mesh back support, gas lift and black legs with rolling wheels. The comfortable, contemporary design will accent any desk setting while offering the option to adjust to your desk height and body shape with ease. A great addition to any home! This innovative task chair provides exceptional support to the hard-working professionals in your office.Transparent mesh across the back allows air to circulate, keeping you cool no matter how high the pressure gets and built-in lumbar support helps prevent back strain and muscle fatigue. Padded flip-up arms take pressure off your shoulders and neck, and flip up and out of the way, as needed. The swivel seat is padded with 3 inches of CA117 fire retardant foam. Its waterfall edge is designed to relieve pressure and promote healthy blood flow to the legs. Raise or lower the seat using the pneumatic seat height adjustment lever, conveniently located under the seat. Turn the tilt tension adjustment knob to increase or decrease the amount of force needed to rock or recline and lock the seat in place with the tilt lock mechanism. The heavy-duty, nylon base with dual wheel casters makes it easy to roll across the floor. OSP Designs Student Task Chair, Blue The funky and functional OSP Designs Student Task Chair features a pneumatic seat height adjustment, which allows it to be paired with desks of all heights. A blue cushioned fabric seat and chair back keeps the design youthful and ideal for students of all ages. The heavy-duty base with dual wheel carpet casters makes it easy to manoeuvre on any number of floors and able to support the wear and tear of everyday use. OSP Designs Student Task Chair, Blue is rated 4.0 out of 5 by 1. Rated 4 out of 5 by IndySingleDad from Basic chair does the job This desk chair is very basic obviously without arms, but for the reasonable price does the job and looks nice. Comfortable and adjustable height. I'm 6'4" and works fine for me.